As some of you are aware, my son Beta got married in August. I had 15 months' notice of the wedding, so there was ample time to knit a fabulous shawl for the bride, Kay. Kay chose the pattern, Evenstar by Susan Pandorf. As the wedding was to take place in either Maryland (the bride's homestate) or North Carolina (where my son and now the newlyweds live) in August, it needed to not be too heavy or warm. I was distraught. I stared at it for perhaps 30 minutes searching to see whether I would be able to fix it. I decided to sleep on it overnight. The next morning, I examined it again, and decided no fix would be perfect enough to suit me for the wedding. And so, I frogged the shawl. And cast on again. At the end of week 2 of vacation knitting, I was almost to the exact same point in the knitting. Cobweb yarn is frustrating for me to knit - it simply doesn't have enough weight to it to hang down well, making digging into those tiny little stitches easier. So, I began using a large skein of contrasting yarn as a tensioning device inside the project (being a circular shawl, it made a "bucket" inside the needle). About this time, I went to a LYS, Heavenly Socks Yarns, Belfast, Maine to find yarn for a shawlette I designed for the bridesmaid and one I designed for the mother of the bride. The wonderful Helen showed me a shawl given to her by a very prolific and excellent lace knitter that was knit from a bamboo laceweight yarn, Xie (Southwest Trading Co.). She had be try the shawl on to feel and see the wonderful drape of the bamboo in lace. I'm looking down on my arm, admiring the lace and felt I recognized the shawl pattern. I asked what it was, only to discover that the shawl was the very same one I was knitting for the wedding! And I like it far better in the bamboo than in the cobweb weight yarn I was using. To make a long story short, I had Helen order the yarn for me, and went home to put the project on a lifeline for indefinite, if not permament, storage. And so, I cast on the shawl for the third time. In June, I took another week of vacation and stayed at a wonderful inn Inn on the Harbor for a week. The windjammers could be seen from the picture window in my room, there was a great deck right on the water for knitting, endless pots of tea, and great restaurants within walking distance. My vehicle never moved all week! And in the inn, I knit. And knit. And knit. And then I started beading the border. And the wedding shawl was finally born for Kay & Dan's wedding. The shawl was draped around both of them at one point in the ceremony, then just around Kay. After a long hiatus from blogging, I have come to the realization that I miss the connection, details and inspiration I got from my fellow bloggers. While FB and Ravelry fill a social need, the details and excitement/inspiration I got from bloggers about yarn, patterns, projects and fiber tools was better from blogging than from social media. I thought about it over the weekend and decided to renew my blogsite and my efforts in that regard. My friends and I even noticed it at SPA that even vendors in fiber festival venues seem to lack the viral blog induced stimulation and variety we used to see. That said, I bring you my wedding shawl saga. My second born son, Beta (aka Dan) is getting married in mid-August to Kay. Kay taught herself to tat via YouTube and actually made herself (and completed) a bracelet from tatting. She also taught herself to crochet via YouTube and finished a crochet sampler afghan in under six weeks (yes, she FINISHED it). I taught her to knit in under 24 hrs (cast on, 3 increases, 3 decreases, stockinette, ribbing, reverse stockinette, garter and bind off). In short, she is a wonderful awesome fiber overachiever. Panic attack ensued, and I set aside the shawl for a night of rest. The following morning, I stared at it for two hours trying to see if I could fix it. Kay is so wonderful and this is a wedding shawl that will be photographed and shown off, so I feel it must be at least close to perfect. I decided I could not fix it undetectably, and so I frogged the entire shawl and started over. A week of cobweb lace knitting lost. I restarted, and in the second week of vacation, I managed to get beyond where I discovered the mistake. Cobweb defies gravity. The stitches from the previous row pop up interfering with one’s attack of the stitch on the needle. I started inserting a ball of soft wool-silk blend inside my work to sort of tug those tiny little bastards down so I could dig into them more easily and reliably. Slow going, and with 560 stitches/row, it takes me about 30 minutes to do a round. Today, I went to Heavenly Socks Yarns to buy more Size 0 Karbonz for Sock Madness. While there, Helen, the shop owner and I were talking (as usual) and I mentioned this shawl and that I wanted a warm weather fiber for knitting a shawlette for myself. She brought out a shawl in a plastic bag behind the counter and made me take my coat off. She put the shawl on me - a lace circular shawl knit from laceweight bamboo, complete with beaded border. Same details as the Evenstar shawl Kay selected. The shawl had a lovely drape and feel. Superb stitch definition. I asked Helen what the pattern was, and she says simply “Evenstar.” Jaw dropped. That is Kay’s shawl. Only I love it greatly in the bamboo, and with the weight and drape of the bamboo not only does it look far better, but it would be a joy to knit instead of a slug. That dawned on me while driving home. 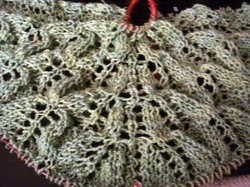 So, I have dropped Helen an E-mail to order the bamboo yarn for me to restart the Evenstar shawl for Kay. I discussed it with Kay, and sent her photos. She and Dan both love the new yarn better as well (though she protested me re-starting again). I am psyched! If anyone had told me 24 hours ago I would be looking forward to happily re-starting this shawl for the third time, I would have thought them crazy. I firmly believe many things happen for a reason. The fiber spirits or my spirit guides knew better than I that my original choice of cobweb yarn was wrong for this project. Thus the dropped stitch that I felt was irretrievable. Thus the slug progress and not getting my rhythm back on the knitting, and not feeling joy in it. Now I am looking forward to the new beginning! 2008 seemed to be a lace year for me. I joined not one, but two lace clubs (YOL and Wooly Wonka), in addition to doing one of the Mystic shawl KALs (Mystic Meadows). Stonewall was the third offering in the Wooly Wonka Fibers lace club, featuring one of Anne Hanson's man lace patterns and Wooly Wonka's Celestial yarn. I haven't done the blocking yet, so I don't know the final measurements. It just came off the needles last night. 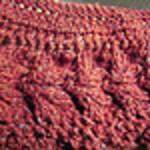 The lace is an easy, 8 row pattern, staggering the repeats to make a nice undulating pattern. I am strongly considering making each of my three sons one of Anne's man lace scarf/stoles for Christmas, using Hypoteneuse and Oh! Canada as the other two. 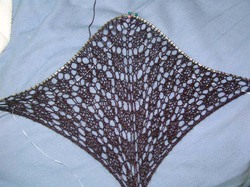 I did not do a gauge swatch, as I figure with lace it is only critical to have sufficient yarn. The pattern called for 29 repeats of the 16 row lace, and I did 25. I had only a few yards of the yarn left after casting off - but even unblocked, the scarf/stole is plenty long for a warm hug during winter. I've really enjoyed Anne's patterns. 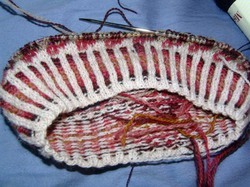 They knit up quickly, don't get boring, and have nice transitions between sections (if applicable). More details on my Ravelry project page. This year, I've been digging into lace a lot. And enjoying it. Kinda got into the rhythm of lace charts....I've joined the Mystery Stole 4 KAL, my first of this series. It is also going to be my first beaded project. I plan to use the crochet hook method for placing beads. I had some stash Suri Elegance laceweight alpaca in black in sufficient yardage for this project. I took it to a bead shop in Bangor, and found some beads which contrast (suggested by the designer), but not a displeasing contrast. The yarn is black, and the beads are a matte sort of irridescent colored bead in dark jewel tones. They should show up, but not compete with the lace design, or at least that is what I have envisioned and hope. Cast on Saturday evening - updates to follow! I joined a lot of groups this year - I've been a long-standing member of Spunky Eclectic Fiber club, and now I've added Zen Yarn Garden Harmony semi-solid sock yarn club , A Change of Seasons lace subscription through Wooly Wonka Fibers , and A Year of Lace 2008 through MakeOne Studio in Canada. Fortunately, the lace ones are a quarterly mailing, so there is hope I will actually keep up. This year, with the advent of "reading" books on my Nano (I love this little device!!! ), I multi-task by "reading" books while I knit and spin. There isn't a spouse here, and my kids are old enough they go off to the TV room, or computer loft and don't speak much to me these days. So, the Nano and the needles/wheels are my companions with dogs surrounding me. All the dogs seem to be at my feet these days - I am guessing I am quieter than the kids' TV and DVD programs are, so they seek me out, with or without the treats and belly rubs. 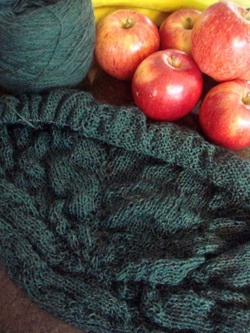 The first mailing for A Change of Seasons is MimKnits' Zephyros shawl in a wool lace weight in dark green. I frogged the very beginning a couple of times the first weekend, but since then, it has been going well. I am now at the transition to a new set of charts, so I took a bit of a break to knit another pair of socks. Soon, I'll be back into this one - I find with lace I don't do well setting it aside for very long, so I am better off forging ahead immediately on it. With fuel oil prices climbing, I seriously turned down the thermostats in the house this year, so wool socks, and wool garments have been welcome and necessary here. 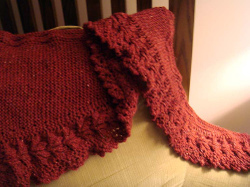 First up are my renditions of the Lacy Kerchief Scarf from IK Summer 2005. I have wanted to knit this for myself for the past 2 1/2 years, and haven't done so. I have, however, now stashed some Rowan Felted Tweed for the project. 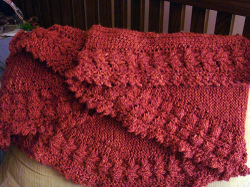 I knit two renditions for Christmas. The first is for Kille's Brother Beta's girlfriend, Jenn. This was her first Christmas with the clan, and I had no idea what would make her happy, or what she needed. I decided this scarf was the item. Notes: I made myself an Excel spreadsheet with two columns - one for the lace pattern repeat row, and one for the increases row. One was eight rows, the other six rows, so the spreadsheet kept me on track. The lace pattern is easily memorized, and though I liberally use stitch markers for my lace projects, I only needed two in this, which delineated the garter stitch section between the top edge border and the lace leaf border at the bottom edge. In the second version, shown here, I used Rowan Felted Tweed held double. 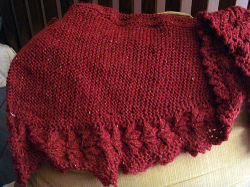 This one I made for a dear friend, who was fondling Jenn's as it was just off the needles. 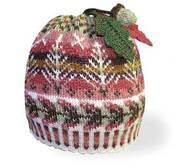 The light finally dawned that Megan needed a handknit present. She is at this moment, the only handknitter/spinner with whom I regularly exchange presents. I just barely got into the seventh skein on Megan's. I have asked Kille's Brother Beta to get me a photo of Jenn wearing hers, and hopefully this evening, I can grab a photo of Megan modeling hers. In other gift knitting, I made each of the four kids a knitted helmet with earflaps - total geek hat using The Fibre Company's Pemaquie a 60% Merino, 30% alpaca, 10% soy wonder that is a bulky weight incredibly soft yarn perfect for warm soft non-scratchy hats! Photo to follow when I can catch an unblurred one. Spinners At Your Wheels - Right Foot, Left Foot, Go !!! The spinners need to use BLACK fiber only, or over dye the yarn once spun to BLACK. These women will only be wearing black during their one year mourning period, so any other color will not be able to be worn for at least a year. Thank you! If you thought you had volunteered and don't find your name on the list, please E-mail us asap! If we should need additional spinners or knitters, we will post again with that information. For now, please hold the offers, and that we thank all of you from the bottom of our hearts for all the volunteering of spinning, knitting, fiber, and other assistance, including thoughts and prayers! The shawls will be the Simple Garter Stitch Prairie Shawl shown on page 53-54 of Cheryl Oberle's book, Folk Shawls. 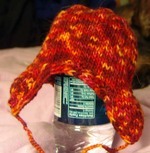 It has simple garter stitch, is triangular, and has a border fashioned by a yarn over eight stitches in from the edge. Very simple and unadorned. Easy to knit, and comforting. The pattern calls for 750 gms of worsted weight, but is easily adaptable to virtually any weight yarn. Since these shawls for the most part are worn in place of a coat, I would think sport, DK or worsted would be the best weights. I am thinking in terms of 1200 - 1500 yds of worsted for the project. Thank you!